Just like in any other medium of entertainment, musicals often find success by capitalizing on familiar tropes and character archetypes that they know audiences will love. Here are our six favorite musicals that focus on the age-old pairing of a small orphan girl and a bald adult man! 1. Ensemble The Musical: Ensemble takes the audience behind the curtain to watch 16 talented adult bald men compete for a single role in a Broadway show directed by a no-nonsense, wisecracking orphan girl. The musical’s incredible costume design has drawn specific praise for the way it subtly helps the audience differentiate between all of the nearly identical hairless men who stand right next to each other onstage for almost two hours trying to impress an 8-year-old orphan and land a role in her show. Featuring catchy Broadway standards like “Where Can I Find A Decent Bald Actor (An Orphan’s Lament)” and “So Many Bald Men, So Few Broadway Parts,” Ensemble is a truly inspiring play about small orphan girls and bald adult men pursuing their love of theater, no matter what obstacles life throws in their way. 2. MORTGAGE: A Rock Opera: MORTGAGE is an early ’90s rock opera about a brave orphan girl who stages a protest against the rich, bald adult man who keeps reasonably asking her to pay for the house she’s been squatting in for 14 years. 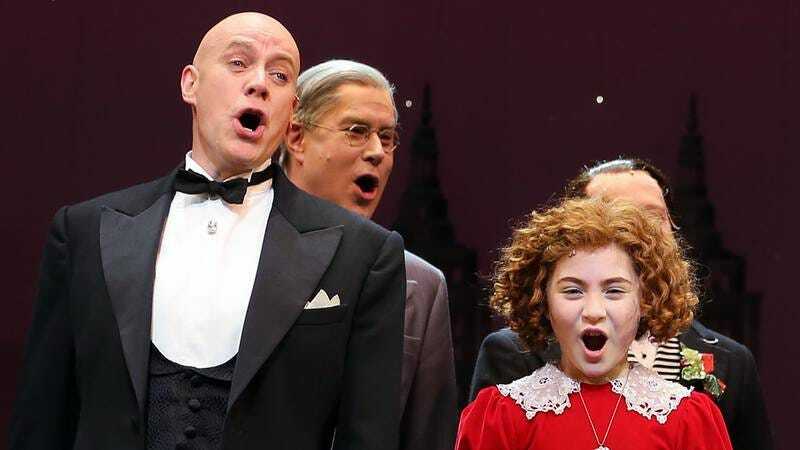 The musical’s iconic opening number, “A Landlord Is A Big Bald Friend You Should Steal From,” sung by the small orphan girl as she steals money from the pockets of the sleeping adult bald man, has become a modern Broadway classic. 3. Annie: The uplifting tale of a small orphan girl with a heart of gold who yearns for a family and finds it in the unlikely form of a bald adult man named Oliver “Daddy” Warbucks. 4. All A-Broad! The Story Of The S.S. Fantasea: This nautical musical comedy from the 1940s truly has it all! All A-Broad tells the story of Peggy Jones, a small orphan girl who has been the headlining performer on the S.S. Fantasea ever since her parents fell overboard one fateful stormy night, a heartbreaking scene immortalized in Peggy’s show-stopping ballad “Now That They’re Dead, I’m A Musical Orphan.” A classic, often-revived show, All A-Broad! is perhaps most famous for its act one finale, in which the S.S. Fantasea suddenly crashes into the musical’s second principal character: a huge bald adult man floating in the middle of the ocean. In the second act, Peggy and the large bald man get rich entertaining passengers of the S.S. Fantasea by performing a double act called The Incredible Dancers Who Are Two Different Sizes. In the musical’s final song, “Big And Small, Hairy And Bald,” Peggy and her nameless bald friend beautifully sum up the moral lesson of the play: It’s okay for people who are two different sizes to make money together on a cruise ship. 6. A Flounder’s Fable: Based on a classic fairytale, A Flounder’s Fable tells the story of Sonny, a rebellious flounder who wants more than anything to live on land as a bald adult man. In pursuit of his dream, Sonny makes a deal with a sea witch and is finally able to make the incredible transformation into a 90-year-old hairless human like he always dreamed. The only problem is, the sea witch says that if the now-human Sonny can’t locate a small orphan girl and go through the proper legal channels to adopt her within three days, he will turn back into a flounder forever. This vibrant, tropical story of identity features family-friendly songs like “I’m Not Used To Being Dry,” “My Name Is Now Marcus,” and “Convenient Beach Orphan.” The original production was widely lauded for its technically impressive “transformation” sequence, in which Sonny magically shifts into a bald adult man (played by the legendary Harvey Fierstein) right in front of the audience’s eyes!